Queenscliff Cottage is centrally located in the heart of Queenscliff. From Geelong Come to Queenscliff on the Bellarine Highway - the B110, and follow the signs to Queenscliff. Turn left into Hesse Street (this is the main street of town) and follow Hesse Street for half a block and you will see the cottage on your left hand side. The cottage is down the laneway behind Murray's cottage, which is 96 Hesse street. From the Queenscliff Sorrento Car Ferry - follow the road into town. As you come around the corner of Wharf Street into Hesse Street, continue along Hesse Street, up the hill, past the Vue Grand Hotel. On the corner of the next block you will see Seaview Guesthouse. Continue a little further along and look for the cottage on the right hand side. The cottage is down the laneway behind Murray's cottage, which is 96 Hesse street. 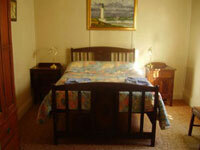 Stay at the romantic Queenscliff Cottages and enjoy the best Queenscliff has to offer! A romantic cottage in the heart of town. Imagine staying in a cottage like your Nan and Pop once did! Step back in time, around the year 1847. Hideaway Cottage is a two bedroom restored cottage, one bedroom with a Federation hard wood Queen Bed and new mattress, and the second bedroom with two single beds. All you need is supplied, including all linen, full kitchen facilities, laundry, even 2 push bikes and helmets! Brand new 26 inch HD TV in lounge with built in DVD player. The cottage has a gas log fire, luxurious 2 person spa, air conditioning and off street parking. For the warmer months an out door covered BBQ area complete with fish pond and gardens. Once parking your car, relax and your stay with us begins, with restraunts, pubs, beaches and parks all within minutes of easy walking. Treat yourself, Queenscliff and the cottage has so much to offer. Hideaway Cottage has two bedrooms, one with a Queen bed and the other bedroom with two single beds. romantic cottage in the heart of town. Imagine staying in a cottage like your Nan and Pop once did! Step back in time, around the year 1847. Hideaway Cottage is a two bedroom restored cottage, one bedroom with a Federation hard wood Queen Bed and new mattress, and the second bedroom with two single beds. All you need is supplied, including all linen, full kitchen facilities, laundry, even 2 push bikes and helmets! The cottage has a gas log fire, luxurious 2 person spa, air conditioning and off street parking. For the warmer months an out door covered BBQ area complete with fish pond and gardens. Once parking your car, relax and your stay with us begins, with restraunts, pubs, beaches and parks all within minutes of easy walking. Treat yourself, Queenscliff and the cottage has so much to offer. A security payment of 50% of the total fee is required as confirmation. Payments may be made by cash cheque or credit card. If guests are unable to attend as per the reservation our cancellation policy is as follows: Deposits will be refunded if cancellation occurs more than 30 days prior to check in date. Less than 30 days and more than 7 days prior to arrival will forfeit the full deposit or 50% of the total booking fee;and 7 days or less - will forfeit 100% of the total tariff. No shows and early departures are deemed cancellations within this policy NB The total booking fee is the "TOTAL TARIFF" Changes to bookings incur an administration fee of $30 in addition to any cancellation fee.